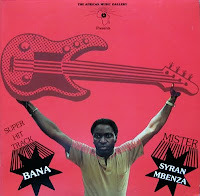 This post is Part 2 of a four part series, a celebration of the career of guitarist Syran M'Benza. Part 1 is below. If you have not seen it already, I recommend that you start there! This compilation contains on song from each of the albums shown below. 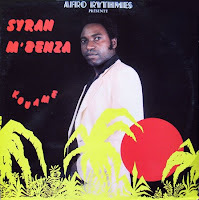 Syran M'Benza's first solo album Kouame, on the Afro-Rythmes label, and the Africamania label album Elisa Dangwa are still today among my favorite albums. On Kouame, Syran M'Benza is joined by guitarists Dizzy Mandjekou, Lokassa Kassia, and Bopol Mansiamina.On Elisa Dangwa, guitarists include Syran, Master Mwana Congo and Pablo Lubadika. With this gem, we are also treated to vocals by guest artists Theo Blaise Kounkou, Ballou Canta and Jose Missamou. 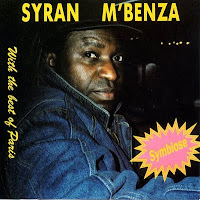 Syran M'Benza recorded a number of other albums under his own name. These were mostly on the Eddy'son label of Eddy Gustave and, in America, on the African Music Gallery label. 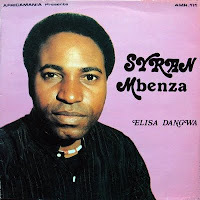 He also recorded, under his own name, another album on the African Music Gallery label that I have not included. Called Africa: The Golden Years, that album was a "non-stop" album, a continuous medley of Pan-African favorites reinterpreted into a soukous style. Although it has long been a consistant dance floor filler among my West African friends, I have not included it here. This album had a sister LP called Maloko: Soul On Fire, another non-stop album, this one featured virtually the same line up of artists interpreting American soul classics into the soukous style. 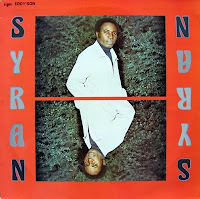 Syran would contribute to a large number of other albums as a much sought after and respected session guitarist, many of which were also on the Eddy'son and African Music Gallery labels. On the Syllart and Hysa labels, he recorded Sisika and Symbiose. You may hear a song from each of these on the compilation. Thanks to C.C. Smith of The Beat for contributing the song Molatisi. I had that album only on cassette and I cannot seem to find it! 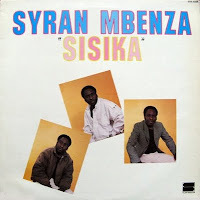 On Sisika, Syran is joined by guitarist Rigo Star Bamundele. Rigo and Syran have worked together quite effectively over the years, Rigo Star contributing greatly to the music of the group Kelele. The line up on Symbiose presents a veritable who's-who of the soukous genre with Syran, Dally Kimoko, Diblo Dibala, Lokassa and Bopol on guitars. Along with 4 Etoiles associates Nyboma and Wuta Mayi, the singers on Symbiose include Passi-Joe and J.P. Ramazani. 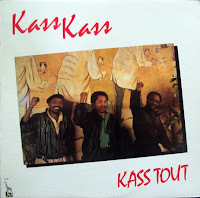 Another of Syran M'Benza's ventures was in the creation of a short-lived but dynamic group called Kass Kass. Passi-Joe and J.P. Ramazani were also founding members of that band. The album Kass Tout is a SMOKER!